Marco Fernandes graduated from the University of Évora and is currently studying for his Masters Degree in Percussion at the Lisbon Superior School of Music under the guidance of Professor Pedro Carneiro. He is a freelancer for the major Portuguese orchestras. Marco is also Professor of Percussion and Chamber Music at Metropolitana (Orchestra National Superior Academy, Metropolitana Vocational School and Metropolitana Conservatory of Music) and at the Music Conservatory Nossa Senhora do Cabo. Additionally, he is the artistic director of the Metropolitana Percussions - percussion group. 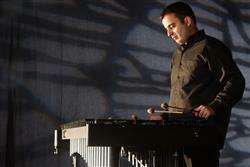 Marco Fernandes represents Majestic Percussion and Innovative Percussion Inc. as performing artist and clinician.